About Absolute Obsession: Triggering an intervention of fate, 42 year old Rose Gerbaldi, discovers her heart and soul have been forever united with beautiful, 30 year old, British movie star, Michael Terrance – - a discovery that compels her reality to fiercely reclaim her, ultimately devastating the very lives fate had so lovingly entwined. Forsaken by a woman he’s never met, unable to control the debilitating agony, Michael seeks solace on the darker side of Hollywood. Meanwhile in Western Canada, having been doubly devastated, Rose relinquishes to a life of loneliness. Both are certain they’ll never again find that for which they long for – - each other. Foolish people – fate is infallible. Hiya. First of all I would like to thank Reader Girls for having me here today. My name is Michael Terrance, I am a thirty year old Ireland born, Britain transplant, as well as a desired movie star (the industry’s words, not mine). I luv the artist side of acting, however care very little for the attention it brings me. You probably think it would be brilliant to have such fame, however once you have been in the middle of the mayhem more than once, just simply because you have stopped off at a fast food place for a burger and chips, I believe you wouldn’t be so quick to enjoy it. Everyone knows everything you’re doing the moment you do it, you have no privacy, your personal life is always the subject of mass publication, you stay guarded about the people you have around you, never knowing if they are truly your friends or if they just want to be linked to you. Out of all of that, the worst part for me, was never being able to find love, always having to keep women at arm’s length for fear they only wanted me because of me name. That is…until Rose Gerbaldi came into me life. She was twelve years my senior and never having met face to face, we had a wonderful telephone relationship, her ability to treat me as a person, keeping me grounded when things got out of hand in Hollywood, was uncanny – she made me feel real again and our friendship quickly, for me at least, turned into genuine luv. She cared about me and treated me for what I was, a human, not the movie star, Michael Terrance. Unfortunately, upon us professing our luv for each other, she cut off all communication, choosing her family over me. Needless to say, having fallen in luv with a voice and someone authentic only to have it end abruptly, didn’t do well for my confidence as a person – she will be mine though. About the author: C. Elizabeth lives in St. Albert, Alberta, Canada. She stumbled upon writing, it found her, she finds writing a peaceful escape and is very excited to have her characters come alive in her readers’ minds. 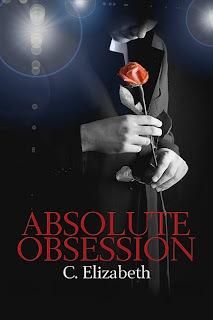 Her contemporary romance novel, Absolute Obsession, is about 42 year old Rose Gerbaldi who by an intervention of fate unites her heart and soul with 30 year old British movie star, Michael Terrance. Please visit and blog with her at www.celizabeth.ca. Connect with her on Twitter at http://twitter.com/#!/search/users/CElizabeth4 and Facebook at http://www.facebook.com/profile.php?id=1567713637. Join C. Elizabeth at the Pump Up Your Book Live! November Author Chat / Book Giveaway Party on Friday, November 18 starting at 8 p.m. eastern! Char will be giving away a copy of her book! You could win a beautiful copy of Absolute Obsession simply by attending the chat and asking her a question. All there is to it! Thank so much for having Michael today, he insisted he be front and centre. :) Thank you.